Tour lasts Approximately 5 1/2-6 hours. 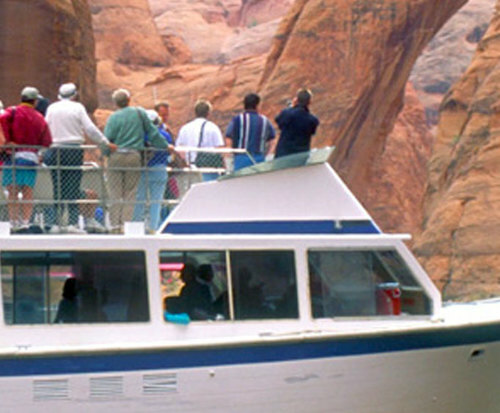 The Rainbow Bridge Boat Tour takes you to a unique treasure of the Grand Canyon area, and as the most photographed geological landmark of the American West, it's a must see during your visit to Lake Powell! You'll cruise past about 50 miles of beautiful sandy shoreline during the 2 hour travel time on the way to the Rainbow Bridge National Monument. 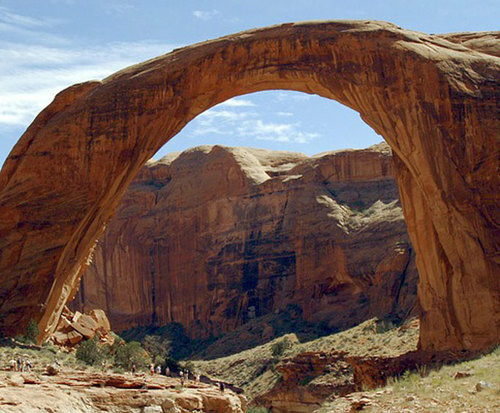 This natural wonder was sculpted by the power of wind and water and is the largest natural bridge in the world today. See a remarkable landscape that spans 275 feet across Bridge Canyon and extends 290 feet into the sky, making it almost as tall as the Statue of Liberty. At the monument your cruiser will dock and you'll have time to walk the fairly easy mile-plus trail to Rainbow Bridge and back. After exploring and experiencing the realm of the Native American spirit, you'll re-board your boat for the return two hour voyage. 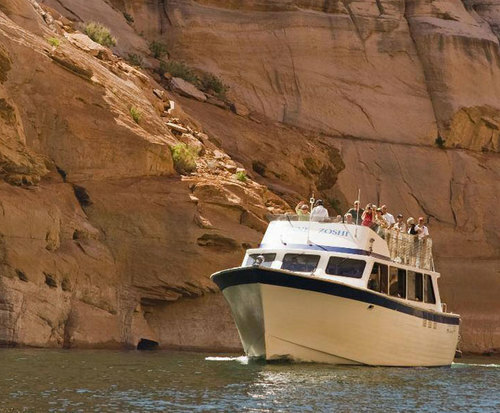 Come enjoy the crystal clear water, wonderful rock formations, and beautiful painted walls as you span cultures in a sacred landscape on the Rainbow Bridge Boat Tour.